GUEST speaker at a recent Gold Coast canon law conference, Irish priest Monsignor John Kennedy, has a great gift to offer the faithful. Msgr Kennedy’s gift as a canon lawyer is to assist Catholics in making often agonising decisions to remain true to their faith. Two topics Msgr Kennedy explored at the recent Canon Law Society of Australia and New Zealand Conference, attended by 80 international canon lawyers, and later discussed with The Catholic Leader, were perfect illustrations of the practical concerns of canon law. One topic, seemingly very close to Msgr Kennedy’s heart in this discussion, was that of Church decisions involving marriage between people with an intellectual disability. The other dealt with the historical development of the Pauline Privilege – the so-called Privilege of the Faith. Its aim is to assist parties in the celebration of a sacramental marriage where there has been a previous marriage that was not sacramental in character. Msgr Kennedy said he was working on a doctoral thesis on the marriage of the developmentally disabled. “I’ve spent seven years working on it at the Pontifical Gregorian University in Rome, as I have a full-time job at the Congregation for the Doctrine of the Faith in the Vatican,” he said. Among factors driving Msgr Kennedy’s studies are two significant life experiences. “I have a dear uncle, now 69, who (has an intellectual disability),” he said. “Also as a young lad I can remember living in Dublin beside the city’s clinic to provide medical assistance and job training for people with physical and mental disabilities. “I would pass this centre every day in my childhood on the way to school. 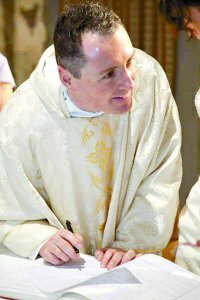 Msgr Kennedy said as time passed and he became a priest he came to think “how lovely it would be to do a thesis on the rights of such people to marry”. There was also a very practical reason behind such a study. “Under Church law, everyone has the right to get married,” he said. “But, canon law stipulates certain persons would not be able to marry validly. “In terms of marriage between two such people, the final decision is the bishop’s. “However, Canon 777 paragraph 4 says parish priests/pastors have a responsibility to provide catechesis to people with a disability. “And in the case of two such people wishing to marry, the parish priest needs to be able to have the tools to decide whether the couple (with intellectual disabilities) truly understand the commitment they are making. Msgr Kennedy, through his studies, quickly found “one thing was for certain”. “If you look at the whole question of developmental disability, no one size fits all,” he said. So the whole endeavour might sound quite impossible. Msgr Kennedy said, however, by using the tools of canon law together with the research of a broad range of experts in the field of developmental disability he was making progress. “It’s another example of how canon law can be applied practically in daily life,” he said. Given this outlook, Msgr Kennedy’s response to United Kingdom celebrity barrister Geoffrey Robertson’s recent comments that the Church should abandon canon law is no surprise. “Canon law is essentially about protecting people’s rights and helping them to understand their responsibilities,” he said. “As human beings we need law – for example growing up in a family we all know there are rules even though they’re never written down. Msgr Kennedy also emphasised the Church’s canon law was constantly evolving. “There is always the need to adapt to change in areas that haven’t been thought of before,” he said. “For example, the Church’s child sexual abuse legislation has had to adapt to current law based on developments in the last 10 years. “Now lay people are encouraged to bring cases of this abuse forward. “It’s now not only seen as a sin but also a crime.